After a four-month pilot program, Microsoft this week rolled out functionality on its Dev Center that lets Windows Phone developers respond to user reviews of their mobile offerings posted on the app store. Microsoft's Bernardo Zamora wrote in a Tuesday blog post that the new feature was being made available to "all eligible Windows Phone developers," without specifying the guidelines for accounts being eligible. 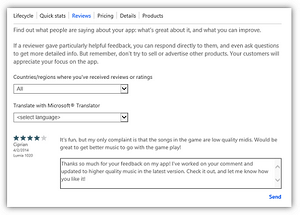 Windows Phone developers have long been clamoring for this respond-to-review ability, which rival app store Google Play has had for some time. The capability was the No. 1 item on the Microsoft User Voice site where it solicits customer feedback and feature requests. The request to "Provide ability for developers to respond to user reviews/feedback," dated April 17, 2011, collected 2,450 votes. When combined with a similar post, the vote tally more than doubled the second-place request. "We are over 2,000 votes on this," read one comment about the request, posted just before the pilot program started. "Clearly it's something that developers want, and Google Play has had this for a long time." Developers can find out if they're eligible to take advantage of the new feature from the Dev Center, where they can select the dashboard, click on one of their published apps and look at the review screen. If a "Respond" button appears in the lower-right corner, they're eligible. Zamora wrote Tuesday, "The feedback from all developers who have been able to respond to reviews has been very positive so far, with developers using this feature to help users resolve questions, inform them of a new version of the app, and increase user satisfaction with their apps." 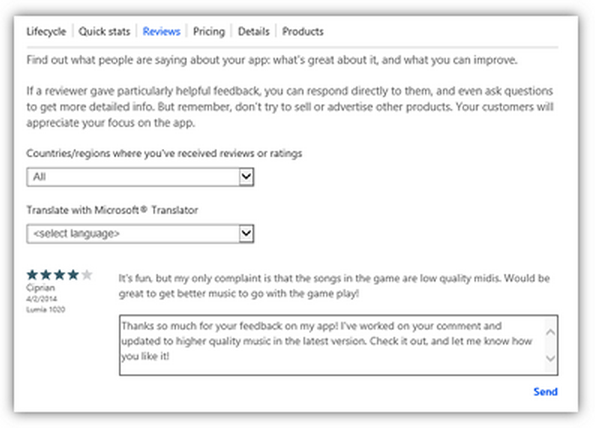 If developers don't follow the rules, Microsoft said customers can report inappropriate review responses from a developer via the Report Concern link in the Details section of an app's store description. "Microsoft retains the right to revoke a developer's permission to send responses when developers don't follow the guidelines," Zamora said.